"Whoever said 'the pen is mightier than the sword' obviously never encountered automatic weapons." 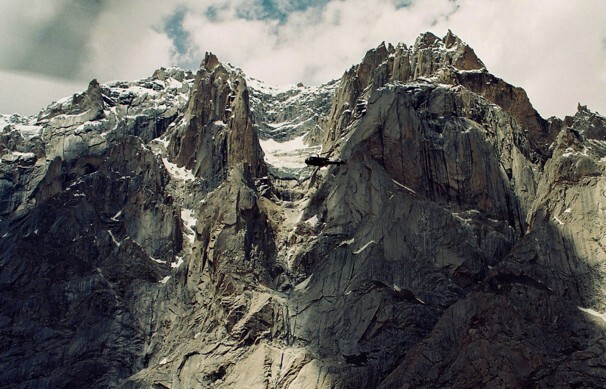 AP/AP - An army helicopter flies over the Siachen Glacier on Pakistan-India border, 2003. The base at Gayari, where the avalanche hit, sits at about 15,000 feet, near a border where thousands of Pakistani and Indian troops stand guard across a no man’s land at elevations up to 22,000 feet. The Siachen Glacier often is called the highest battlefield on Earth. -Richard Leiby, “Himalayan avalanche buried scores of Pakistani troops, army says,” Washington Post, April 7, 2007. Something about this phrasing – despite the tragedy of the situation – inspires wonder and awe. The fact that I’m captivated by it is a reminder that I’m still a nerd, which I appreciate. There’s a cinematic quality to it; an air of futility as well. It’s akin to spacefaring battles, or a war on the moon. An alien, inhospitable landscape that men are willing to die for. This reflects my own tastes more than anything, but much writing on India and/or Pakistan, though especially the former, seems to take place in the teeming cities or lush semi-jungle areas. But there’s a very distinct subcurrent in military-related fiction and literature set in the mountains and passes. Think General Raj-Singh, the Tiger of Delhi. Or a temporary safehouse in Himachel Pradesh. 10th Mountain: there may be hope for you yet. Their task now was to blast the defenses away and go south through that pass, down to some level below this floor of the universe. The pass to India, supposedly. Gate to a lower realm. Very well defended, of course. The “Muslims” defending it remained invisible, always over the great snowy mass of granite peaks, greater than any mountains on earth could be, asura mountains, and the big guns brought to bear on them, asura guns. Never had it been so clear to Bai that they had gotten caught up in some bigger war, dying by the millions for some cause not their own. Ice and black rock fangs touched the ceiling of stars, snow banners streamed on the monsoon wind away from the peaks, merging with the Milky Way, at sunset becoming asura flames blowing horizontally, as if the realm of the asuras stood perpendicularly to their own, another reason perhaps that their puny imitation battles were always so hopelessly askew. The Muslims’ big guns were on the south side of the range, they never even heard them. Their shells whistled over the stars, leaving white rainbow frost trails on the black sky. The majority of these shells landed on the massive white mountain to the east of the huge pass, blasting it with one stupendous explosion after another, as if the Muslims had gone crazy and declared war on the rocks of the Earth. One of the more interesting results of last night’s UNSC vote to authorize a no-fly zone over Libya was the voting pattern of the Council. More specifically, the abstentions. Two things jump out: all four of the BRIC countries abstained from a vote, and of these five countries, the three which are not already members of the P5 are heavily discussed candidates for membership should the council expand. Do they too see themselves as a bloc? Or was it just coincidence? So it’s interesting to try and ascertain where this reluctance comes from. One can just throw out some crude snapshots: Germany is wary of overseas military operations. China and Russia see any intervention as an ominous precedent and a threat to their own national sovereignty. India and Brazil don’t want the responsibility, perhaps, and see a vote on Resolution 1973 as a distinct voting record that could come back to haunt them (much like the conventional wisdom explaining why a United States senator would never be electable as president). Also interesting are the military capabilities of these five countries. All, with the possible exception of Brazil, have formidable land armies, but lack a great deal of expeditionary capacity or any meaningful power projection. China has been making the greatest strides in this area with their naval armament program, but is still a long ways off from being able to physically support operations like a Libyan intervention. Much the same goes for Russia, even if the recent Mistral purchases were an attempt to provide new command-and-control capabilities that would make such a deployment easier. Despite NATO’s series of capability commitments, developing a true airlift capacity remains stuck. Germany is the European leader of strategic lift, and yet still only operates the woefully outdated C-160. Its replacement, the A400M, has nearly three times the weight capacity – but has been delayed yet again and will not enter service until 2014 at the earliest. So even discounting moral reservations, Germany might have some legitimate tactical concerns about intervention in Libya. Of course, to have to write something like this implies a great deal of cynicism on the part of the international community. The ‘clean voting record hypothesis’, in particular, is a rather damning indictment of why nothing gets done politically either in the international or domestic realm. No matter the reason, though, it appears as if the BRIC countries are their own power bloc, and they’re not going to help if they don’t want to. Which perhaps then begs the question of why the West has to intervene whenever a dictator starts murdering his own people. President Obama dropped a bombshell and a “guaranteed applause line” on his passage to India: he will back an Indian seat on the UN Security Council. And quite frankly, it’s about time. The only two countries opposing it were China and the US, so while this doesn’t completely clear the path for Indian accession, it does smooth it. Japan makes sense, but adding/subtracting members is going to irritate virtually everyone no matter how it’s done (which explains why none of it has been done before). I think we can agree right off the bat that losing members is a non-starter. No one will voluntarily give up a seat, and thanks to veto power, it’s hard to see France or Britain ruling themselves into irrelevance, no matter how much that might make sense. If they both stay then, why would Germany not deserve a seat? As the largest economy and most populous country in Europe, there’s little reasonable objection to their membership. Then we get into regional representation. If Russia, India, and China all have a seat, why doesn’t Brazil get one? Or if we go the route of an EU seat, why not UNASUR? And/or the African Union? Will the Middle East get its own seat? Would Pakistan demand one? It is an excruciating set of compromises that would have to be made in order to change the membership of the Security Council at all. Perhaps the largest barrier, though, is the scale of enlargement. The G8 didn’t evolve into a G10, and then a G12, and so forth – it went straight from G8 to G20. And if the Security Council is to add any of the up-and-coming powers, it will probably have to add them all. David Axe says this could be “tantamount to a declaration of war.” And I personally believe it’s a sign of things to come. With much of the region militarizing (even South Korea is getting in on the mini-carrier game), major destabilizers like this will become only too frequent. But when you’re talking about the two most populous nations on earth… you really only need one of these events to provoke a full-out catastrophe. On behalf of France, La Coloniale and the Armée d’Afrique performed admirably in both combat and occupation duties during World War I. The French Africans who served in Europe came from all across the empire—Tirailleurs from Senegal, spahis from Tunisia and Algeria, and goums from Morocco, 175,000 in all. 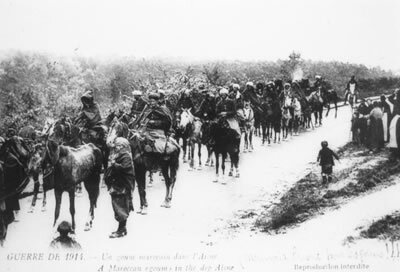 Other local regiments of Tirailleurs from equatorial French Africa were in turn deployed to the French colonial possessions in North Africa, and many others (about 160,000 in total) joined the Armée Métropolitaine in France on an ad hoc basis. In combat, the colonial troops proved themselves beyond a shadow of a doubt. Many succumbed to the illnesses brought on by the radical change of climate, and for the most part, the harsh European winters meant that the African units would winter in the south of France. To some, this was reason enough to doubt the effectiveness of Africans in combat, but it was always ignored that these ‘deficiencies’ had nothing to do with the fighting skill of men from the tropics. World War I was more global in scope than is often realized. World War I belligerents; Allies are green, Central Powers orange, and non-aligned are gray. The colonial forces of both Britain and France were tried and tested in theaters throughout the globe, perhaps most surprisingly in India itself. Thanks to the Anglo-Japanese Pact of 1902 there was no direct threat across the frontier – as the Japanese would pose in World War II – but the fighting in the Middle Eastern theater often spilled over in the Punjab, and nationalist revolts there and in Bengal threatened to destabilize the Raj. In Mesopotamia, there were three mutinies by Muslim soldiers unwilling to fight their fellow believers, but for the most part native troops remained unwaveringly loyal. Even the horrific casualties in the various African campaigns did not dissuade colonial troops from fighting alongside their occupiers and preserving their own subjugation. Part 2 of a 5-part series. The Sepoy Mutiny of 1857 can be attributed to many factors, but foremost was the British persistence in attempting to alter the traditional culture of India, particularly the ‘civilizing’ efforts of modernizers and evangelical Christian missionaries. 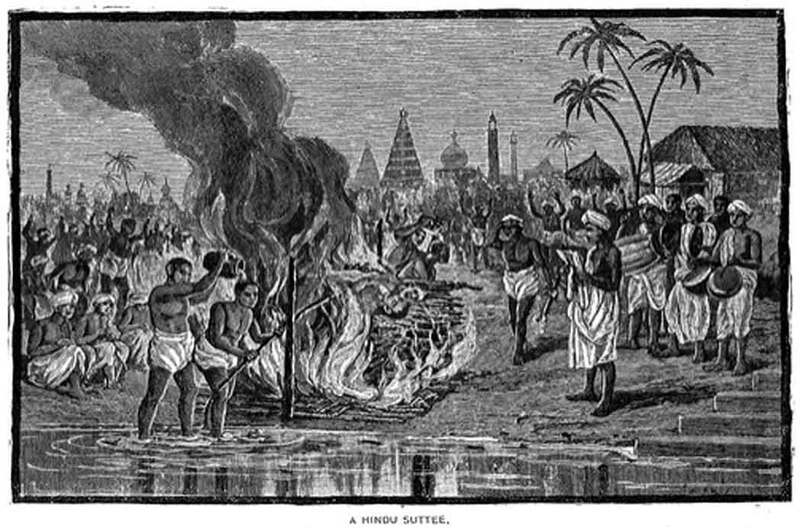 The three practices of female infanticide, thagi (a supposed cult of assassin-priest highwaymen), and sati (ritual self-immolation by a widow) were the most heinous in the eyes of British. While these attempts at eradication did not even enjoy the pretense of East India Company legitimacy, it was nevertheless believed by many Indians that every Briton had come to stamp out Hinduism and Islam alike.